After attending the Kingdom Hall for about two years I was baptized by the Jehovah’s Witnesses on July 9, 1983. I was convinced, as most Witnesses are, that I was part of the only true religion on earth. I was in the antitypical “ark” of Noah, Jehovah’s visible Organization on earth. I believed that my membership in this organization was the only way to be saved. Looking back, I can now see that the Witness’ teaching had forced them into a corner. Let me explain: the “other sheep” do not receive immortality as do the “144,000.” They will continue as flesh and blood humans who attain human perfection. The Watchtower cannot apply Jesus’ words in Luke 20:34-36 to the 144,000 because they do not believe the angels are immortal. Luke 20:34-36 says, “The children of this system of things marry and are given in marriage, but those who have been counted worthy of gaining that system of things and the resurrection from the dead neither marry nor are given in marriage. In fact, neither can they die anymore, for they are God’s children by being children of the resurrection.” Applying Luke 20 to the 144,000 would then require the Watchtower to teach that the angels are immortal. This they could not do – so their only choice was to apply it to the “other sheep,” but in doing so, they created this contradiction. I was heartbroken. I did not want to be celibate while many of my family and friends would be enjoying family life in human perfection. Weren’t Adam and Eve told to “be fruitful and become many and fill the earth”? I did not question the Scripture; it was the application that did not make sense. My constant prayer was that I would not be killed or die of some disease before Armageddon. Despite this, I did not question the validity of the Watchtower. I was confident that it was some mistake and that a correct understanding would come in the future. Where else could I go? All the churches that I knew about, taught the immortality of the soul, and going to heaven at death, or burning in “hellfire” – all teachings that I could never accept. •The nation of Israel no longer plays any role in God’s plan. •Among Jehovah’s Witnesses only the literal number of 144,000 are designated as spiritual Israel. •The great crowd of other sheep are not spiritual Jews, they are Gentiles who attach themselves to the 144,000. Zechariah 8:23 is used to support this view. •In the Kingdom, the 144,000 – “spiritual Israel” – will rule over the “great crowd” – people of the “nations” (Zech. 8:23) as kings and priests. After reading the Luke 22 passage above, I sought out the Watchtower position on the identity of the “twelve tribes of Israel” in Luke 22:30. To my surprise, they actually were teaching that these 12 tribes of Israel are the “nations” of Zechariah 8:23 – the “great crowd” of “other sheep”! In Watchtower theology, the “other sheep” are not spiritual Jews. Luke 22 forces them to teach two contradictory teachings at the same time because they have to identify the 12 tribes apart from Spiritual Israel, because the Apostles will be judging them! Once natural Israel is eliminated from their understanding as having a part in God’s plan, they have no choice but to state that it is the other sheep who then become the 12 tribes of Israel in Luke 22. They are actually teaching two opposite teachings simultaneously – because they say that the other sheep are not spiritual Israel or Jews of any kind, but in Luke 22 they say these 12 tribes are the other sheep! Although I was very puzzled, I still did not question or doubt the validity of the organization because in my mind there was nowhere else to go. I was still convinced that I was “in the truth” and the Watchtower Society were devoted servants of God and that in time through their intense study of the word in Brooklyn, they would clear up the inconsistencies that I saw. I continued actively in the “door to door service.” One day I was asked to explain Matthew 8:11, “But I tell you that many from east and west will come and recline at the table with Abraham and Isaac and Jacob in the Kingdom of the heavens;” As soon as I read it, I could hardly speak. I had never noticed this passage before. At the time I was convinced that there were “two classes” of believers. The 144,000 would go to heaven and receive the “heavenly kingdom” while all the rest would remain on earth. “All the rest” included Abraham, Isaac and Jacob. I could not escape the clear words of Jesus himself that Abraham, Isaac and Jacob would be in the “kingdom of the heavens.” I told the man that I would come back with an explanation. When I researched the Watchtower understanding of this passage, it was so unbelievable that I was too embarrassed to give the man the explanation. I felt it couldn’t possibly be true. The explanation given was that Abraham is “symbolic of Jehovah God,” Isaac is “symbolic of Jesus Christ,” and Jacob is “symbolic of the 144,000.” Additionally, what proved to me that this explanation was incorrect is the parallel statement in Luke 13:28 where Jesus adds “all the prophets” to his statement about Abraham, Isaac and Jacob. Who did all the prophets “symbolize”? This discovery in Hebrews 11 was very devastating, as every Bible I could find, read “heavenly” or “celestial” in this passage. The most devastating of all was the Watchtower’s own Kingdom Interlinear. The word-for-word English beneath the Greek reads, “Now but of better(one) they are reaching out for, this is of heavenly one…” I wondered why they would paraphrase the Greek word to read “one belonging to heaven” in Hebrews 11:16 and translate it as “heavenly” in the very next chapter -12:22? I questioned the inconsistency. Was it possible that the Watchtower could not have their members read a verse that so thoroughly contradicted their fundamental beliefs? For the very first time, I was deeply troubled. In fact, I was shattered, for my mental safety-net was gone. The man I had been talking to in my door-to-door service did not believe in the immortality of the soul, going to heaven when you die, hellfire or the trinity. He believed that the Kingdom of God would be on earth, all of which I believed and still believe to be Bible truths. The living nightmare began. I was now married to a Witness, I had a stepson, and I had persuaded my mother to become a Witness. My brother in-law was a Witness and my two nephews were Witnesses. I knew what leaving meant – total shunning from family and friends. As each year passed, the nightmare deepened as I continued to see more and more from reading the Bible on my own and realizing that my belief-structure was probably wrong. I was on the verge of a nervous breakdown. I confided in my doctor who put me on antidepressants. I could not confide in any Witnesses because they would have immediately gone to the Elders and told them I was doubting. I wanted the freedom to sort this out myself. I eventually sent a lengthy letter to the Brooklyn headquarters. In the letter I pleaded for help. I told them that I was on the verge of a nervous breakdown and had been put on medications by my doctor. I did not mention the letter to anyone in my family or to anyone at my Kingdom Hall. About two months later a Witness Elder from my congregation phoned and told me that he had been asked to deal with my issues. Brooklyn had contacted the Elders as opposed to addressing my letter personally. The Elder came to my house and pointed out all the “good works” the “organization was doing that no other organization was doing. To him this was “proof that Jehovah’s Witnesses had the Truth.” To put things in perspective I asked him to read Matthew 6:1-4, “Take care not to practice your righteousness in front of men to be noticed by them; otherwise you will have no reward with your Father who is in the heavens. So when you make gifts of mercy, do not blow a trumpet ahead of you, as the hypocrites do in the synagogues and in the streets, so that they may be glorified by men. Truly I say to you, they have their reward in full.” I also asked him to read Matthew 23:15, “…you travel over sea and dry land to make one proselyte…” After he read these two passages he was very upset with me. I pointed out to him that I was not trying to be disrespectful but the fact of the matter is that no one should boast. Secondly, all the preaching in the world does not make us right, as the inspired Word clearly says. Traveling over sea and dry land to make one proselyte is not proof that we have the Truth! I also pointed out to him that the contents of my letter was what I hoped to be discussing. He refused. I suppressed my doubts for a few more years and said nothing to anyone. Eventually, we moved to another province “where the need was great” hoping that the Watchtower would receive “new light” and that everything would be ok. One evening speaking from the platform I happened to quote Romans 2:21, “Do you, however, the one teaching someone else, not teach yourself?…” How could I possibly go “door to door” and tell others to question the teachings of their church and act upon that questioning, when I was unwilling to do the same? This time there was no turning back. I still had the hope that the Watchtower was right but I was not going to allow men to be masters of my faith. How ironic it was that I concluded that this was the reality – God was not the master of my faith but men. I was not the only Witness in this position. This new harsh reality was brought home in an agonizing way when a young Witness friend of mine committed suicide by jumping into the Atlantic Ocean. I had played table tennis together with this young man in my basement. He was a very handsome, God-fearing, clean-cut fellow. He was just 23 years old. All the times we had played together neither of us could trust the other enough to confide our doubts. I had no excuse. I had become a Witness as an adult. No one had forced me to join. Rodney, on the other hand, was raised a Witness. His whole family were Witnesses; his entire circle of friends were Witnesses. For Witness youth there is no way out. Even if you do not get baptized and leave, you are still shunned as a “disapproved associate.” Rodney was not a rebellious young man; he was a “regular pioneer” putting in 90 hours per month. He had nowhere to turn but the Atlantic Ocean. When he killed himself the thoughts expressed among the congregation were that he was “selfish” and “couldn’t face the difficulties of being a true Christian.” I found out later from neighbours that Rodney had actually confided in some of his school friends about his religious doubts. I found it ironic that he could not go to his own Brothers and Sisters when he was experiencing such traumatic difficulties in his life. For Witnesses “there is no way to leave” without experiencing the harsh consequences of doing so. The “reason” is irrelevant. If you leave to become a criminal or leave to pursue a path that you feel is a path of true righteousness, the treatment you experience is the same. Rodney’s suicide will haunt me all the days of my life. What if we both had had the freedom to confide in one another? He might still be alive today. In April 1991, I left the Watchtower religion. On April 28th I was baptized into Christ. My wife divorced me and my stepson hasn’t spoken to me in 27 years. My mother read the Bible from cover to cover without the Watchtower publications and three years later she left the Organization and was baptized into Christ. The ordeal almost killed her. She was 83 years old. On June 18, 2017, she fell asleep at 100 years of age awaiting the resurrection. For the first time in my life I had actual faith. I had a firm belief that God and Christ would actually guide me. Is it frightening at first? Yes! Most importantly, it is a true promise from God and Christ that they will help you to find your way. “Keep on asking, and it will be given you; keep on seeking, and you will find; keep on knocking, and it will be opened to you; for everyone asking receives, and everyone seeking finds, and to everyone knocking, it will be opened.” (Matthew 7:7) The very passages that I assured others with, now assures me, “Indeed, a man’s enemies will be those of his own household.” (Matthew 10:36) “… Do not forsake me and or leave me, my God of Salvation. Even if my own father and mother abandon me, Jehovah himself will take me in.” Psalm 27:9,10. It’s one thing to be able to quote a Scripture, it’s another to be able to live it. In the 27 years since I’ve left the Watchtower Organization I have found freedom like never before. I can actually have discussions with those of my own congregation and disagree without fear that I’ll be cast out for doubting or questioning. It gives me so much joy to take out my Bible and read it for myself – whole chapters – all the way through. I feel so much relief that I no longer need to tally up my ‘good deeds’ in a monthly time card. My nagging questions are finally answered. I believe that I have found the Truth and the freedom to keep researching whenever necessary. In the end I am only concerned with whether or not I believe and teach the Truth according to God. It’s God’s Truth that I want to believe and teach to others – not the teachings of men. If anyone wishes to speak with me I would be delighted to do so. We only have one objective for investigating this very important Watchtower teaching – and that is to reach out in a caring way to many sincere, devoted believers, who love the Truth and deserve every opportunity to find it. Jehovah’s Witnesses believe that a literal 144,000 believers will go to heaven and become immortal to rule over the other unnumbered class who are considered the ‘subjects’ of the Kingdom Age. These subjects, according to the Watchtower, live on earth and do not receive immortality but eventually over time, attain to ‘human perfection.’ This belief is based on a handful of passages that we will consider in this investigation, such as John 10:16; Luke 12:32; Matthew 11:11; Revelation 7:1-10. The Watchtower freely admits that this teaching of the 144,000 is not taught anywhere in the Hebrew Scriptures. Jehovah’s Witnesses say this teaching was first realised by Jesus’ disciples at Pentecost in Acts chapter 2. The disciples were still expecting Jesus to reign on earth in Acts chapter 1:6. Therefore anyone who died prior to Pentecost would have no idea of what is termed the ‘Heavenly Hope.’ Up until the Pentecost of Acts 2, the hope of every believer was to live on earth forever. The official position many years ago was that the calling of this ‘little flock of 144,000’ began at Pentecost and ended in 1935 – which is when the full number had been chosen. The only way for someone else to be part of the 144,000 would be if one of the chosen became unfaithful and then someone else would have to take their place. In the 1950’s the Watchtower taught that there was about 12,000 of the 144,000 left. We are now in the year 2019. No doubt changes to this number have been made to accommodate this unexpected passage of time. and Christ is only a mediator for the 144,000. The Watchtower teaches that only the 144,000 are ‘Abraham’s seed’ (Galatians 3:29 – ‘heirs with reference to a promise’). Only the 144,000 have this ‘heavenly hope’ and prior to Pentecost in Acts 2, it was an unknown belief for anyone except for Christ. Therefore, the ‘new covenant’ is only for the 144,000, which is why they are the only Witnesses who can partake of the bread and wine. Can this complex teaching withstand a series of Biblical passages that would indicate otherwise? Additionally, are the passages used to support this teaching clear enough to teach it in the first place? Is 144,000 supported as a literal number by the rest of Scripture? Is a literal 144,000 supported by the description recorded in the book of Revelation itself? There are several Scriptures which demonstrate there are not two separate classes of believers. Hebrews 11:16, describes the hope of many faithful men and women who died prior to Pentecost in Acts 2. According to Watchtower teaching, the O.T. faithful had no idea that there would be a ‘Heavenly Kingdom’ as they lived before the revelation of the ‘Heavenly Hope’ at Pentecost. These versions make it very clear that all the faithful prior to Pentecost were hoping for a ‘heavenly’ country or homeland. Is there a reason to ‘hide the thought’ in Hebrews 11:16? The author of “Truth in Translation,” Jason David BeDuhn, speaks very highly of the NWT saying it is the most reliable of the nine Bible translations he compared. BeDuhn is a competent Scholar and his conclusions are generally accepted. However, BeDuhn also concluded that all the translations he examined were bias toward their theological views, with the NWT being less inconsistent than the other eight. For BeDuhn, “inconsistency in translation is often an indicator of bias,” (Pg 108). As seen in Hebrews 11:16, the NWT has been inconsistent in translating this verse. Due to their unique ‘Two Class’ belief, a literal translation would be very confusing to their members. The Watchtower’s own cross-reference to Luke 13:28, 29 shows that they accept it as a parallel statement. If Matthew 8:11 is symbolic – then Luke 13:28 must be as well. So then, ‘all the prophets’ must be symbolic. Who does the prophet Jeremiah symbolise? Or Ezekiel? Or Elisha? This becomes quite complicated and is not explained in Watchtower writings. However, if Luke 13:28 is literal, then it proves Matthew’s account to be literal as well. Reading Matthew 8:11 and Luke 13:28 literally, we have the simple, clear teaching that Abraham, Isaac, Jacob and all the prophets will be together in the heavenly Kingdom, with all other believers – one hope – one class. One class of believers is very clearly endorsed in the book of Galatians. Paul makes this statement in Galatians 3:29, “Moreover, if you belong to Christ, you are really Abraham’s offspring, heirs with reference to a promise.” Yet, according to Watchtower teaching, the Christians in Galatia are going to heaven to be part of the ‘Heavenly Kingdom’, of which only the literal number of 144,000 will partake. These 144,000 have been chosen ‘from Pentecost and onward.’ They believe that NO ONE prior to Pentecost in Acts 2 has the ‘hope’ of ‘going to heaven.’ All the faithful who died prior to this event, receive what they term ‘the Earthly Hope’, thus separating believers into two ‘classes’ with two separate ‘hopes’ – the Heavenly Hope and the Earthly Hope. According to Paul, Isaac receives the same promise as the believers in Galatia. Isaac is not separated into another class who receives a hope different from the Galatian believers. 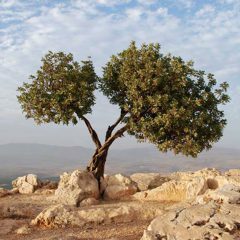 Consider also Paul’s words in Galatians 3:9, “So those who adhere to faith are being blessed together with Abraham, who had faith.” The Gentile Galatians are viewed as Abraham’s seed due to their faith. They are blessed WITH Abraham, not as a separate class with a different destiny. It doesn’t make sense that Abraham’s descendants will receive a greater promise than their father. Notice the consistency of the three passages we have considered in Galatians 4 and Hebrews 11, with Jesus’ words in Matthew 8:11. These passages are very clear; there are not two classes of believers and there is only one hope. However, in all fairness, let’s take a look at the most oft-quoted passages the Watchtower uses in support of their teaching. We’ll begin with John 10:16. Jehovah’s Witnesses teach that since Jesus references ‘other sheep’ there must be two classes of believers, with two separate hopes. The Watchtower teaching is contradictory within itself. Within the organisation there are still TWO CLASSES – they have not been made into one. That is why only the 144,000 partake of bread and wine. Yet, Jesus said they would all become ‘ONE FLOCK,” one shepherd.’ If Jesus’ words are taken verbatim as he said, all Jehovah’s Witnesses would partake of the bread and wine. Instead we see that the ‘other sheep’ which Jesus referenced, are simply the Gentiles, who are now included in the one flock. The emphasis that the Watchtower places here is on the term, ‘little flock,’ in contrast to the “great crowd’ in Revelation 7:9. The inference is that the ‘little flock’ is fewer in number than the ‘great crowd.’ It would appear from these terms that the Watchtower has a relatively sound argument. But context and an overall knowledge of Scripture has to be the final arbitrator in understanding each statement. The overall teaching of Scripture is that very few will be saved, in contrast to the many who are not. For example, in Israel as a nation, very few were faithful in comparison to the unfaithful. Jesus himself, talked about two roads – one leading to life and one to destruction. The one leading to life had very few that found it, the one leading to destruction had many. (Matthew 7:13-14). When taken in context, the ‘little flock’ of Luke 12 is consistent with the overall teaching of Scripture, that very few find the road to eternal life. However, depending on the context, a different emphasis may be used. Context is vital. We can see this from Acts 6:7 where we read, “and a GREAT CROWD of priests began to be obedient to the faith.” (NWT 1984 Large-Print Edition) How many priests were converted? Was a ‘great crowd’ considered hundreds of priests, or hundreds of thousands? It is very interesting that the 2013 Revised Edition of the NWT translates this verse as ‘large crowd’ as opposed to ‘great crowd.’ This is done despite the fact that the Greek word in Acts 6:7 and Revelation 7:9 is the same (‘polus’). It is doubtful that the Watchtower would have changed this word, creating inconsistency, had they not been sufficiently challenged on this very point. The term ‘great crowd’ is one of the most common terms in Witness vocabulary. Once again the Watchtower has gone against their own policy – “an effort has been made to give as literal a translation as possible where the modern-English idiom allows and where a literal rendition does not, by any awkwardness, hide the thought… Uniformity of rendering has been maintained by assigning one meaning to each major word and by holding to that meaning as far as the context permits.” (NWT 1984 Large-Print Edition, page 7, paragraph 3 and 4) The change to ‘large crowd’ from ‘great crowd’ only confirms that this is one of the most challenged doctrines within the organisation, enough so as to warrant a resort to inconsistency. Luke 12:32 then provides no proof that there are two classes, based upon the terms ‘little flock’ and ‘great crowd.’ If it did, were there more than 144,000 priests who converted in Acts 6:7? Watchtower teaching is that only those with the ‘Heavenly Hope’ receive immortality in the ‘Kingdom of the heavens’, while those with the ‘Earthly Hope’ remain on earth and receive ‘human perfection’- a state which they liken to Adam and Eve before the fall – very good – but not immortal. Therefore, they say, those who receive immortality are ‘greater’ than those who remain on earth. Matthew 11:11 then, for Jehovah’s Witnesses, is a contrast between the two ‘hopes.’ Matthew 11:11 certainly does teach a contrast, but what is the contrast between? Is it between two different ‘hopes’ of believers, or between our mortal life now compared to immortal life in the world to come? Jesus himself was “made a little lower than angels…” Hebrews 2:7. This all changed of course when he was raised from the dead and given immortality. The question then, is what is the contrast, described in Matthew 11:11, in regards to John the Baptist? Is it a contrast between an alleged ‘earthly hope’ and a ‘heavenly hope’, or is it a contrast between life in our present age and life in the future when the ‘Kingdom of the heavens’ is established as described by Christ in Luke 20:34-36? Matthew 11:11, then, is a contrast Jesus is making between the superior state of those enjoying the future hope of immortality, as opposed to the mortal state that we all share in this life – however great we may be. So what is the Biblical criteria to be one of the 144,000? Within Watchtower theology only the 144,000 know that they are of the Heavenly class. It is often stated that if you have to question if you are one of the Heavenly Class, then you are not one of them. For the Watchtower, the criteria is a personal ‘experience’. The standard passage quoted to support this view, is Romans 8:16, “The spirit itself bears witness with our spirit that we are God’s children.” This statement is taken to show that there is a direct communication from God to the individual. The criteria according to John is ‘belief’ and not an experience. It’s available for ‘everyone.’ To demonstrate that it is truly for ‘everyone’ consider Jesus’ dialogue with Nicodemus. Why would Jesus rebuke anyone for something that is impossible for them to know? This exchange between Jesus and Nicodemus contradicts any idea that there was a future revelation with regard to those who are born again, because this exchange took place about 3 years before the Pentecost of Acts 2. If it wasn’t until Pentecost that the new ‘revelation’ was given to them, then why would Jesus have rebuked Nicodemus 3 years earlier, for not understanding what it meant to be ‘born again’? Very simply, David believed in the coming Messiah and even predicted his death and resurrection. David predicted this through the Holy Spirit. He was a man after God’s own heart, born of the spirit. The criteria of ‘belief’ is clearly provided in the Hebrew Scriptures itself. Romans 8:16, then, is not about an ‘experience.’ It has everything to do with an individual putting aside his fleshly desires in order for his thinking to correspond with the thinking of God. “Therefore, become imitators of God, as beloved children, and go on walking in love, just as the Christ also loved us and gave himself for us… ” (Ephesians 5:1) The subject matter in Ephesians 5:1-6 is very similar to Romans 8. Salvation for anyone, regardless of the time-period in which they lived is based upon their exercising faith in the Messiah, whether they looked forward in faith as Abraham, David, Moses, etc, or whether they lived in Jesus’ own day, or whether like today, we look back in belief through the Biblical record. Is 144,000 a literal number? Thus far, Scripture has provided no evidence that there are two classes of believers, one ruling over the other. Can it be demonstrated from Revelation itself, that the number 144,000 is not a literal number, but symbolic? The whole nature of Revelation is one of symbolism. If the 144,000 was a literal number, then the 12 tribes of Israel referred to in chapter 7 would have to be literal as well. How can we take the number 144,000 as literal when every other aspect of this description from verse one to verse eight, is symbolic? The fact that Revelation 7:1-8 describes John hearing the number 144,000 and then after that, John sees a ‘great crowd,’ does not necessarily mean that they are two separate groups of people, but viewed from a different perspective. The symbolic 144,000 are more likely the ‘great crowd’ – which no man can literally number. The Watchtower teaches that this group in Revelation 5, is the 144,000 because they are made ‘to be a kingdom.’ According to the Watchtower’s beliefs, the 144,000 in Revelation 5, comes from ‘every tribe and tongue and people and nation’, which is exactly where the ‘great crowd’ of Revelation 7:9 is drawn from. It can be demonstrated from the Bible and by using the Watchtower’s own beliefs, that it is impossible for the 144,000 to be a literal number. Anyone can count to 144,000. The seed of Genesis 13:16 cannot be counted, thus corresponding to the ‘great crowd’ ‘which no man can number’ of Revelation 7:9, and demonstrating that 144,000 is a symbolic number.